BENGALURU: The buzzword of the year in Bengaluru’s F&B circles has been millets. Once a poor man’s grain, millets have surfaced as a hip ingredient served in style on city’s finest tables. Chefs in Bengaluru rediscovered this versatile grain to stay in tune with the worldwide trend of championing the cause of local ingredients and suddenly the traditional grain found a top spot in global dishes like risotto, exotic salads and pizza. Celebrity chef Abhijit Saha introduced millets in both his middle-eastern and Spanish menus at Fava and Caperberry the moment his restaurant philosophy adopted the three pillars namely organic, artisanal and local. Millet and Karnataka black rice risotto is one of his bestsellers today. He has added millet to middle-eastern dishes like Falafel and Tabouleh. The multigrain pizza uses millet flour. Even at his newlyopened eatery Rock Salt, he has launched millet biryani, millet bisibelebhath and millet & yam tikki as day’s specials. “Offbeat millet is the new cool for the wellheeled and health-conscious Bengalureans,” says Saha. Since Karnataka is one of the largest producers of millet, restaurants here are giving it much deserved attention. “Currently, Bengaluru ranks top in India in serving avant-garde millet dishes at eateries. People are realizing that it’s good to eat a variety of grains. Varieties available are abundant. It’s easy to work with since it can be used in boiled or flour forms,” adds Saha. Agrees restaurateur and celebrity chef Manu Chandra. “Awareness, accessibility and propagation of the grain by the food industry, ministers, home cooks and bloggers has pushed the narrative here way ahead of other Indian cities,” says Chandra, who has also been roped in by the Karnataka Agriculture Department for its #LetsMillet campaign. His restaurant Toast and Tonic, which started with two-millet inspired dishes now has expanded to 10. 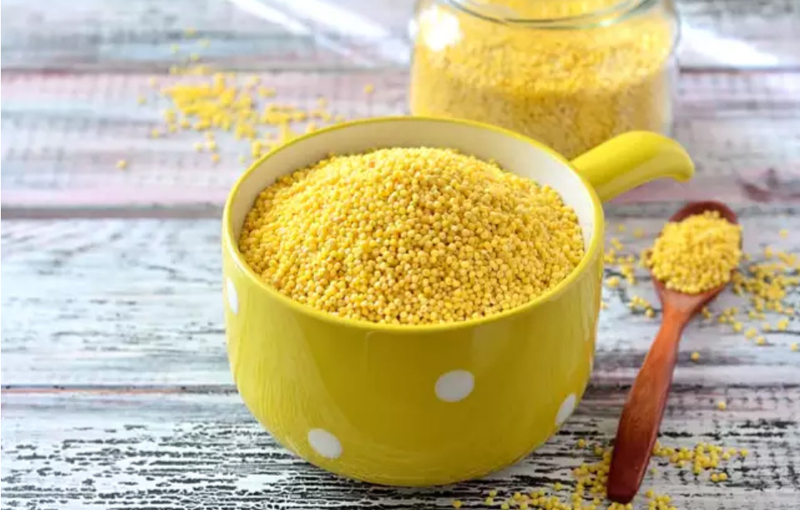 He has started milling millets in-house now and exploring its use beyond classical applications and incorporating it in breads, crackers and porridges. The idea is to make millets part of his pantry and contribute to the millet movement in earnest. Restaurant chain Maiyas has dedicated a day to millet-based food. On what it calls Healthy Wednesdays, the Indian food eatery will provide breakfast, lunch and dinner made exclusively with millets. “Earlier, there was not enough technology to incorporate millets into this segment. With the state government championing the cause, food businesses have access to machines, expertise and technology. This is why the millet segment is witnessing such an upswing,” says owner and food industry veteran P Sadananda Maiya. Besides top drawer eateries, food delivery startups caught the millet fever and diversified its portfolios. Like Freshmenu launched a millet extensive menu to cater to the growing demand by weight watchers, selling almost 1,000 portions a day. “Millets became hip ten months ago. Like fashion, food is cyclic too. With local becoming trendy, premium eateries rediscovered millets. In the coming year, millets will gain the status of rice and daal. It’s not fad food,” notes food and beverage expert Aslam Gafoor. Chefs follow worldwide trend of championing the cause of local ingredients.